The Model TR-RE2SS Trim Ring is designed for recess mounting the Model RE-2SS Residential Telephone Entry System. 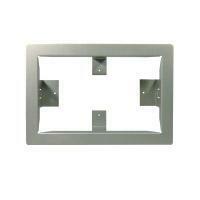 The flush-mount trim ring attaches to the wall studs or custom framing. The RE-2SS attaches to the mounting ring.